There are only so many certainties in life; the Earth is round, water is 2 parts hydrogen to 1 part oxygen, Joanie loves Chachi, John Lennon was a musical genius, and no Chardonnay in the world tastes like Chablis. This small hamlet, just a few hours south of Paris, relays the link between place and taste perhaps more than anywhere else in the world. The reason dates back to a unique soil formed by the recession of a prehistoric basin that once covered parts of northern France including the eastern Loire, southern Champagne, and most notably, Chablis. Known famously as Kimmeridgian marl, this limestone based soil is layered with fossils of ancient aquatic life. To say the wines from this region taste of salty seashells would seem obvious and on the nose, but it would be impossible to taste the best examples from Chablis without proclaiming that very fact. And few in this village are translating that distinct salty marine life into their wines as clearly as the Pinson family. 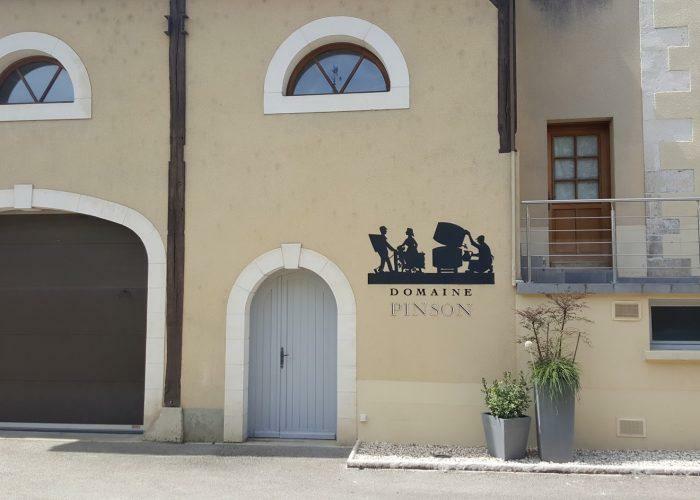 In a region so steeped in history (and prehistory), Domaine Pinson stands out, having farmed in Chablis since 1640. Perhaps the family's most important figure, Louis Pinson, led the domaine in 1940 to become one of the first properties in Chablis to sell directly to the public, establishing them as early adopters of estate bottling. The domaine today is run by the dynamic Charlène Pinson and her father Laurent. They own 14 hectares of the crème de la crème of Chablis terroir, with prime holdings in six premier crus and the grandest cru of them all, Les Clos. It is the duty of a conscientious grower to maximize the potential of these historic parcels of land by farming in a respectful and sustainable manner. Charlène and Laurent view themselves as not only farmers, but protectors of this sacred land. They choose to not use any herbicides or pesticides in the vineyards, while also ploughing and working the soils – pushing their vines to dig deeper into the limestone bedrock that endows the wines with the unmistakable Chablisienne cut and precision. Charlène and Laurent's philosophy in the cellar is defined by an informed flexibility. They believe that every parcel requires a unique vinification. To express their terroir, some vineyards are barrel fermented, while others are fermented in tank. Aging also sees a variety of vessels, including older barrels and stainless steel –Charlène follows no dogma, only using experience to determine the best approach for each terroir. It is an intuitive process, one which results in a stunning display of intense purity across the Domaine Pinson range, seamlessly marrying the historical grandeur found in Kimmeridgian marl and the noble Chardonnay of Burgundy.